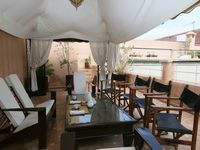 Property 22: Riad of charm any comfort with swimming pool without opposite and big sported garden. Property 23: Villa to rent 29 Apple Gardens, Rue de Fes, Marrakech. Property 37: Villa Marrakech for 10 people with large pool, stove and internet. Property 42: Traditional house of charm any comfort with swimming pool without vis-à-vis. A perfect rural retreat and a base for exploring Marrakesh and the High Atlas. Property 48: A perfect rural retreat and a base for exploring Marrakesh and the High Atlas.